Mary Peng, co-founder of the International Center for Veterinary Services in Beijing, has wanted permanent residence in China since the country's green card scheme was launched in 2004. As a resident of China for more than 23 years, Peng knows that having a green card would make life more convenient by eliminating the annual hassle of renewing her work visa. But qualifying for a Chinese green card isn't easy. Foreigners are either required to invest more than $500,000 in China, be considered an elite talent whose expertise contributes to China's development, be married to a Chinese spouse for five years or more, or be over 60 with no immediate relatives overseas. "I've looked at the requirements. I think it's too difficult," said Peng, an American. 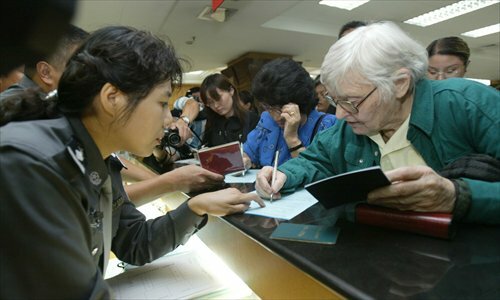 But foreigners eyeing a green card might have more luck in applying for one as China looks to relax its permanent residence policy. In June, the Organizational Department of the Central Committee of the Communist Party of China (CPC) announced that it would lower the application and approval threshold for green card candidates to lure foreign talent to China. A time frame for when the new regulations would take effect wasn't announced. Peng described the move as a "wonderful" development, noting greater consideration should be given to foreign business owners who contribute to China. "Lots of people will apply, and so will I. In terms of investment, the requirement is too difficult. If you set up a company here [in China], you must meet capital requirements," she explained. "Is it not enough to use a business license and reference letters from clients to prove that we're making a real contribution to the society when we apply for a green card?" 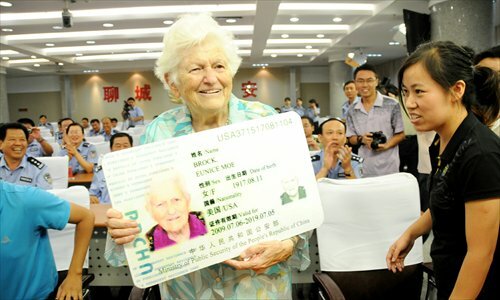 But owning a green card isn't a ticket to the easy life in China, with its low recognition among service agencies meaning it is rarely a substitute for a passport when making day-to-day transactions. Legal experts caution that rather than lowering the threshold of its green card requirements to attract foreign talent, China should instead take steps to enhance its overall national strength. The Annual Report on Chinese International Migration (2014) found that around 840,000 foreigners legally reside in China. One of the most appealing benefits of obtaining a green card, which must be renewed every 10 years, is that it allows foreigners to stay in China without a visa. Chris Hughes, managing director of UniStar Insurance Brokerage, said that he is considering leaving China after 16 years in the country due to complex visa procedures. "It's not getting any easier for foreigners to live and work in China. The visa is the biggest problem. Going through this every year makes us think we are not welcome," said Hughes, a Briton. Hughes would like to get a green card, but said limited information about the scheme has left him and some other foreigners unclear about whether they are eligible for permanent residence. 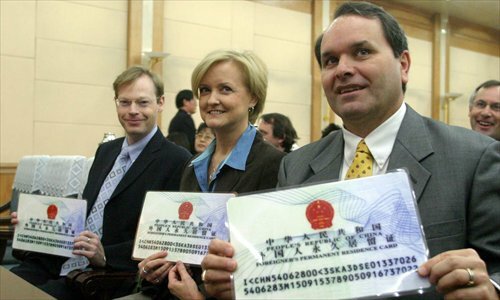 Between 2004 and the end of 2011, around 4,700 foreigners were granted green cards in China. As of May 2014, more than 1,300 foreigners have been given permanent residence through a talent recruitment plan known as the "1,000 talent plan" or through recommendations by central ministries and provincial governments, according to the Organizational Department of the Central Committee of the CPC. By comparison, the US issues about 1 million green cards annually, according to the US Department of Homeland Security. China first made permanent residence available to foreigners in 1986. Between then and 2004 when the current green card scheme was launched, fewer than 100 foreigners were granted permanent residence. A green card can be used as a form of identification for foreigners in lieu of their passport for purposes such as buying a train ticket or booking a hotel room. However, low recognition among most Chinese about green cards makes it useless in many cases. In 2013, Shanghai-based newspaper Dongfang Daily profiled the case of 58-year-old green card holder Rona Noyan, a Turkish national. Following him for a day, reporters observed whether Noyan's green card was useful in opening a bank account and checking in to hotels. In most cases, his green card was rejected. Noyan, chief representative at Turkish Garanti Bank in Shanghai, was one of 38 foreigners to receive the 2005 Magnolia Award for their contributions to the city's social and economic development. He is also the first Turk to receive a master's degree from a Chinese university. When Noyan showed his green card to staff at Citibank and the Industrial and Commercial Bank of China, tellers at both banks declined it as acceptable ID in opening bank accounts. A Motel 168 hotel also rejected Noyan's green card when he tried booking a room, the Dongfang Daily reported. But Noyan didn't get the cold shoulder everywhere, with his green card accepted by the Shangri-La Hotel in Lujiazui, Shanghai, and Shanxi Securities staff, who allowed him to buy A-share stocks normally only sold to Chinese. Liu Guofu, an expert on immigration law from the Beijing Institute of Technology, said that reforms to the green card scheme are difficult to predict because they are devised by the ministries of public security and foreign affairs, as well as the State Council. Differing assessment standards among government agencies for green card applicants also hinders the policy, Liu said. According to Liu, a green card is appealing to foreigners who have worked in China for a long time, are accustomed to life in China and still want to live here. "Besides eliminating the complicated procedure of renewing a work visa, foreigners with a green card can enjoy the benefits of social insurance like Chinese natives," he said. Liu added it's important to create a fair, competitive environment for foreigners who have no friends or guanxi (personal connections) in China, and it is necessary to learn from green card schemes of other countries, such as the US and Japan, to improve the framework. He would also like to see the term "talent" include more than just technocrats from overseas, noting that too much consideration is given to applicants' jobs and not enough to their capacity to contribute. "We should expand the categories of 'talent,' and assessment should be open to the public. It is no good closing the door and only depending on several experts to evaluate [green card eligibility]," said Liu. Song Quancheng, director of the Institute of Migration Studies at Shandong University, told Metropolitan that Chinese permanent residence is currently more lucrative to migrants from developing countries rather than developed ones. "The key to attracting foreign talent lies with our economic ability. If we want to lure talent from developed countries, we should offer competitive salaries that rival standards in their own country," said Song. China should further relax its green card policy for overseas Chinese applicants who have talent that can contribute to China's development, added Song. "For foreigners who get green cards through marriage, it's hard to determine whether they are in a genuine or sham marriage. We should therefore prioritize green cards for foreign talents and investors," said Song.